Dutch abstract artist Ronald Hunter has been creating the last five/six years. It’s a wide range of different abstract paintings in all different color scemes. Most of those will be in his favourite color blue/ turquoise but also bright red or even neon colors are very often used. His studio you can find in Rotterdam, where he works and has his own artgallery. (Open on regular hours, but when you come by , please check first if he will be in). Inspirated by graphic design and illustrations, you will find besides the abstract paintings also some typography and simple illustrations. 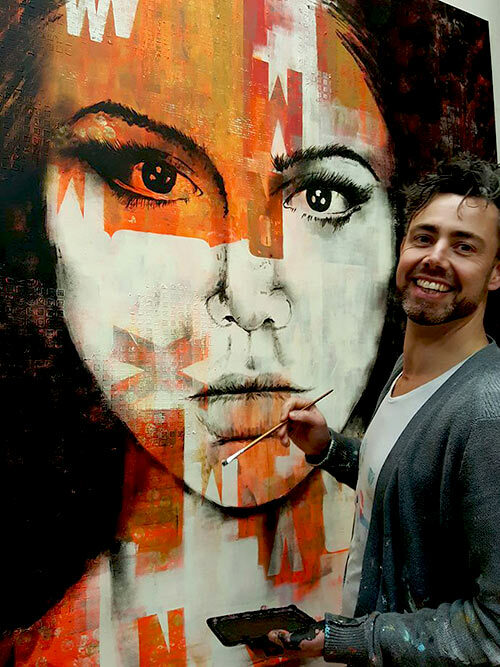 The latest artworks will have the more pop-art kind of look and he uses a lot of female faces to complete the artwork to a more stand out piece. Abstract artist Ronald Hunter is a firm believer of fairly priced art. He invites everyone to shop his original art, and worry less about the pricetag. Below a short portrait of Ronald Hunter. It shows you where and how he works on a specific art piece during a day. The video is shot by Beeldstift.